STAUNTON, RICHARD, HBC cooper, warehouse-keeper, and factor; fl. 1694–1741. The date and place of Richard Staunton’s birth (and indeed, of his death) are unknown; but in 1694 he was a qualified cooper and was sent to serve as such at York Factory (Man.) by the Hudson’s Bay company, at an annual wage of £10. 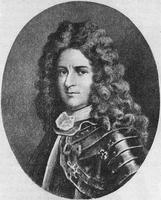 Within a few months of his arrival the post was surrendered to Pierre Le Moyne* d’Iberville although 36 heavy guns were mounted for its defence. The HBC men were promised a passage to England, but they had to spend the winter in the woods, and afterwards suffered much on the journey, being treated as common criminals in the prisons of France. Like Henry Kelsey*, Staunton survived the hardships; he was in London by 1696, was engaged by the company, and was again sent to York, which was recaptured by the English that year. Staunton became a prisoner of the French for a second time when Iberville reappeared in September 1697, fought and sank the man-of-war Hampshire, and again took the fort. Once more, Staunton was soon in England and recruited by the HBC, and in 1698 he was ordered to Fort Albany (Ont.). From the loss of York in 1697 until its reoccupation in 1714 after the treaty of Utrecht, Albany was the only post at the bay in English hands. Staunton served there until 1706, still young enough to claim (later) that he had spent his youth in the company’s service. His wages rose steadily, to £40 in 1705, and when he rejoined in 1708, after coming home in 1706, they were £48 a year. All the men at Albany were demanding “very extravagant terms” for remaining to face probable attacks from the French, but Staunton’s increases related also to his growing knowledge of the fur trade, and in 1712 he was getting £60 a year as warehouse-keeper at Albany. With the treaty of Utrecht and the reoccupation of York, Albany lost some of its importance, but it remained the company’s main post for opposing the French coureurs de bois from the south. Staunton, made chief factor there in 1714, was instructed to “trade hard” with Indians from the north so that they would take their furs to York, but to entice Indians from the south away from French traders and draw over trade from the Eastmain River. These orders involved delicate variations in the prices paid for furs, but Staunton appears to have given satisfaction, and when he was recalled in 1715 it was at his own request since a raise in pay had been rejected. In 1716, however, his successor, Thomas McCliesh, reported that the unruly men at Albany had done what they liked with Staunton. Staunton was unable to return to the bay until 1716, and was then almost immediately re-engaged for four years at the suggestion of James Knight*. Knight was in charge at York and wanted Staunton as a stand-in for himself if he should go to establish Churchill (Man.) or visit other posts. He described Staunton as the best qualified man to manage Indians and to understand the trade. Staunton was sent to Churchill in 1718 to be chief trader there, subordinate to York. It was he who was instructed to name the new post Fort Prince of Wales, and he reported on the defences and the extent to which the post might draw trade away from York. Staunton was a staunch supporter of projects for “discovery to the northward.” In 1721 he sent the intrepid traveller Richard Norton to bring in some Northern and Copper (Yellowknife) Indians who claimed to know where the rumoured copper mine was, and he supported Kelsey’s efforts to find a way to the mine, either “by water in Cannoes through the Countrey and not to come Creeping by Land,” or by sea-voyages to the north and west. Staunton was still in command in 1722 when John Scroggs* reported that he had found the grisly remains of Knight’s search for gold, copper, and the legendary strait of Anian. He had in fact been recalled in 1721, at the end of his contract, but the ship of the year had been unable to call at the post. When Christopher Middleton took him aboard the Hannah in 1722 he called Staunton “a good-natured easy man,” but at Churchill the trader had inspired confidence. Staunton was re-engaged that same year and was sent again to command at Albany, where discipline was such a problem that he reported the men as “Sotts to a man.” But he supported his predecessor, Joseph Myatt*, who was demoted to deputy at the post, apparently because he had taken an Indian boy into the trading-room and had taught him to read and because he had held aloof from the general debauchery. 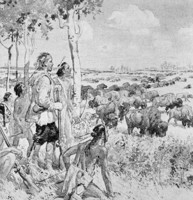 As previously, Staunton’s chief task at Albany was to entice the Indians from the south away from the French by variations in his standard of trade. His contract ran out in 1726 and he retired claiming he had done a good job. Myatt, however, despite Staunton’s support for him, claimed that Staunton had exaggerated his success against the French and had not imposed his will on the men. HBC Arch. A.6, A.11/2, A.11/43, A.11/114; B.42/a. HBRS, XXV (Davies and Johnson). Morton, History of the Canadian west. Rich, History of the HBC, I.
E. E. Rich, “STAUNTON, RICHARD,” in Dictionary of Canadian Biography, vol. 3, University of Toronto/Université Laval, 2003–, accessed April 20, 2019, http://www.biographi.ca/en/bio/staunton_richard_3E.html.